THOISE (Siachen Glacier), Sept 27 (UNI) — The guns from across have been relatively quieter this year but as winter creeps in on these treacherous icy wastes, the longest airlift in history continues relentlessly, attaining new heights. 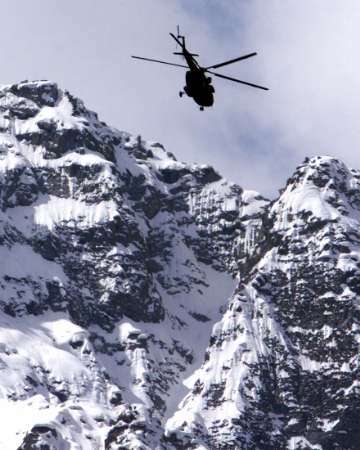 The drone of the MI-17 helicopter or the clatter of the Cheetah chopper periodically breaks the strong silence in this wind-swept base camp of the world’s highest battle field, taking off for another mission in the forbidding reaches of the Siachen glacier. For the troops bivouaced on the ledges of the mountains or in tiny posts on the floor of the glacier, the sounds of the Indian Air Force choppers and the airdrop of equipment and food is their momentary contact with civilisation. Post-Kargil, there has been a 60 per cent increase in the air maintenance operations by the IAF’s fixed wing aircraft, the IL-76 and AN-32, and 100 per cent by the helicopters. All this without any increase in the IAF’s assets, Air Vice Marshal Satish Jain, Air Officer Commanding, Jammu and Kashmir, tells newspersons proudly in the briefing room of the base camp at 10,066 feet. After last summer’s Kargil conflict, the IAF’s responsibilities towards maintaining supplies has increased. Besides equipping one brigade in the Siachen, another mountain division of the Army has been inducted into the Kargil area which has two forward brigades which together have almost 30 posts expected to be cut off by snow in winter. In addition, there has been increased deployment of troops in the Gurez sector. Because of the increased tonnage per hour, several forward maintenance bases have been activated by the IAF. Before the Kargil conflict, the total task of the IAF was to transport 19,000 tonnes a year with both transport aircraft and helicopters. Now with an additional corps, 14 Corps based in Leh, the IAF’s target in Jammu and Kashmir is 30,000 tonnes a year, an increase of 60 per cent. The task of hauling an average 100 tonnes on every clear day is done by one squadron each of the IL-76 and AN-32 and two sqaudrons each of MI-17s and Cheetahs which are regularly based at Chandigarh, Jammu, Udhampur, Leh and Thoise and supplemented when the need be by fixed wing aircraft from Agra and rotary wing aircraft from Hindon and Sarsawa. Since 1984, after a battalion strength force of the Indian Army occupied the glacier and choked off the Pakistani access through Bilafond La and Sia La, the Siachen air operations of the IAF have been going on making it the longest air logistics operations in the history of the world. Almost everyday, 365 days a year, the MI-17s drop loads upto 6 to 8 tonnes at lower helipads on the glacier at heights of over 17,000 feet. The Cheetahs enter the picture when posts at heights of over 20,000 feet, many having an eyeball to eyeball contact with the Pakistanis, have to be serviced. Besides, there are the casualty evacuations, one a day on an average. There is nothing comparable in the world to the IAF’s air maintenance operations — Operation "Meghdoot" — in the Siachen glacier. It was because of the IAF’s airlift capabilities that India has been able to hold on to the Siachen, says Air Vice-Marshal Satish Jain. The helicopters work in these hostile conditions much beyond the limits set by the manufacturers. The pilots who find extremes of temperatures from -30°C in winter to 30°C in summers do a minimum of 30 to 40 landings, half of them at very tiny helipads above 15,000 feet. The IAF is now awaiting the newer versions of the MI-17 with better avionics, all weather radars and the ability to carry more payload to be inducted by the end of the year in the sector. Air Commodore F. H. Major, Air Officer Commanding, Leh, says the helicopter pilots come under fire quite often. 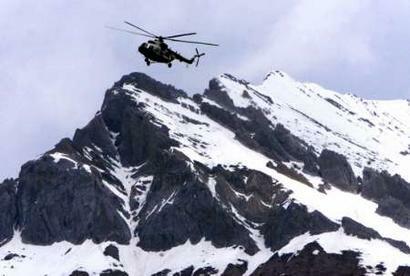 But for every helicopter pilot in the IAF, flying in the Siachen is the most challenging opportunity. Total white-outs are a common occurrence, the danger of going down in crevasses when powerful down draughts pull the helicopter inwards and the skillful manoeuvering required when flying in close proximity of the mountains in strong winds are the hazards that the chopper pilots face. The Siachen is 76 km long and has numerous subsidiary glaciers. Of these glaciers, only three glaciers have a relatively easy access towards the west — the Gyong La, the Lolofond, which terminates into the Bilafond La and the Sia La which drops down to the Khorkhandus glacier. To the north are the difficult passes of Indira Col, the northern-most point of India, and Turkestan La which are contiguous to the Shaksgam valley, illegally ceded to China by India. The northern part of the glacier is dominated by India and in the central part there are some places where the Pakistanis can observe Indian posts. The southern glacier is where there are eyeball to eyeball situations. Along the line of control this year the firing from across has been sporadic and not as heavy as last year, according to officers in Kargil and Leh. But with the winter setting in, no chances can be taken. And, there is no break in the IAF operations. In fact, according to Air Vice-Marshal Satish Jain, the force is only looking at ways on optimising its efforts even though the men and the machines are already operating beyond their designed envelopes.  An-32 [K3057] soars above the clouds. 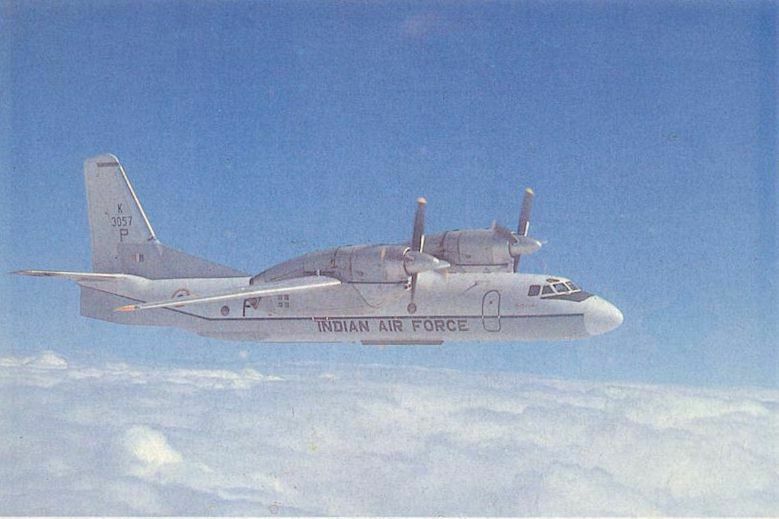 An-32s form the backbone of the IAF transport fleet with more than a 100 acquired. This aircraft was especially developed to cater to IAF's hot-and-high performance requirement. These helicopters routinely fly in such terrain and climate throughout the year.